Les her hvordan H.M.S "Effingham" totalforliste, H.M.S. "Matabele" ble skadet men klarte å holde seg flytende og lt H,M.S. "Coventry" var i bunn uten å bli skadet , alt under samme grunnstøting. Dette har du ikke hørt om før!! D. 3A. 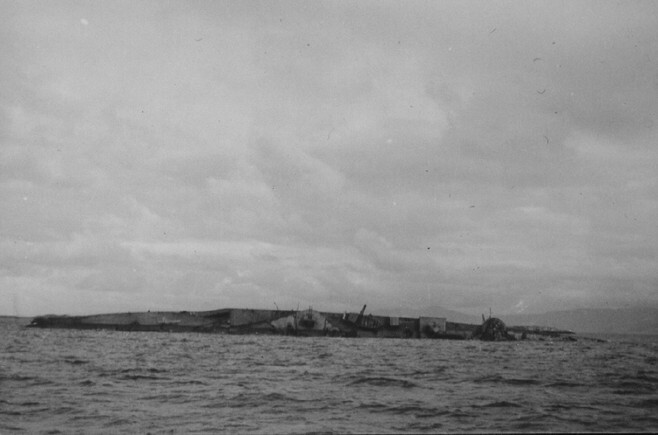 REPORTS OF LOSSES OF H.M.SHIPS. H.M. Transport Sobieski at Sea. I deeply regret to report that whilst proceeding through Briksvaer Channel, 67 17' North 14° 00' East at about 1948 on Friday 17th'May, H.M.Ship EFFINGHAM grounded in position approximately one and a half cables south of Faksen Shoal. 2. EFFINGHAM was operating under the orders of the Rear Admiral Commanding 20th Cruiser Squadron and was on passage to Bodo with the South Wales Borderers, Headquarters 24th(?) Infantry Brigade and 167th(t) Field Ambulance together with 10 Bren Carriers and some 150 tons of stores and ammunition. 3. At l915 the Rear Admiral Commanding 20th Cruiser Squadron had directed EFFINGHAM to lead COVENTRY and CAIRO through Briksvaer Channel bein'pregeded by MATABELE and ECHO (see R.A.20th Cruiser Squadron's 1555/17). EFFINGHAM had ordered MATABELE to take station ahead of her 4 cables, and ECHO 1 1/2 cables on the starboard beam of MATABELE (see EFFINGHAM's 1721/17 ) . 4. EFFINGHAM had been ordered to be guide of the Fleet. 5. The passage of the Briksvaer Channel, as opposed to the normal approach to Bødo, had been suggested by me, and concurred in by the Rear Admiral Commanding 20th Cruiser Squadron (see signal "A") since it was considered that there would be less likelihood of enemy subnarinee being encountered there than in the normal passage. 6. The Briksvaer Channel is admittedly more foul of navigational dangers than the normal approach and it is noted that on page 204 of Norway Pilot, part III, lines 21 et seq., it is remarked that vessels with local knowledge can make this passage - (it may here be interpolated that this qualiflcation concerning "local knowledge" appears to be general in Norwegian waters except with regard to main ship channels,and, hitherto, experience had shown that no extreme regard need be paid to it, provided normal pilotage precautions were observed). 7. Whilst admittedly EFFINGHAM had no previous experience of this route, I did have in my possession a large scale Norwegian chart, number 65,on which the navigational features are clearly marked in a much clearer manner and on a larger scale than Admiralty Chart No.2311. On that basis, I considered that the navigation of Brikswaer Channel was perfectly practicable and recommended its use to the Rear Admiral accordingly. The Earl of Cork and Orrey G.C.B.,G.C.V.O. 8. At 192S ships position was fixed as 67° 15.2' `North 13° 37` East,course O4O°. The gyros had previously been checked by transits. EFFINGHAM was proceeding at 290 revs having reduced from 300 revs (22 knots) consequent on a signall from Rear Admiral Commanding 20th Cruiser Squadron to the effect that A.A. cruisers were finding the speed excessive. (During the passage from Harstad 10 revs had been used for keeping station as the speed ordered (22 knots)). 9. At about 1926 EFFINGHAM as guide of the Fleet hoisted the signal "my course 080°- destroyers take up appointed station". 10. At that time COVENTRY was some 6 to 7 cables!astern, with CAIR0astæ n of her. MATABELE and ECH0 were some 5 cabloe on EFFINGkAM's starboard bow. 11. At about 1927 (Svartskj Island not yet clearly defined), EFFINGHAM hauled down the signal and altered cours to 080° to bring the north shore of Briksvaer Island on that bearing. 12. At about 1935,as soon as Svartskj Island was clearly defined), course was altered by signal 10 degrees to port together to bring that island on the correct bearing 080°, and shortly after, course was again altered, 10 degrees to starboard together, when steadied again on 080°, the north end of Svartsk Island bore 080°. 13. At thls time MATABELE was slightly to port of EFFINGHAM's line of advance and was ordered to get ahead which she did beforore grounding. ECHO who had been too far to starboard, had been ordered not to exceed 11/2 cables from MATABELE (see EFFINGHAM's 1935/17). 14. At about 1944 signal "alter course in succession097°" was hoisted. 15. When MATABELE was ahead of EFFINGHAM, EFFINGHAM hauled down the Guide Pendant. This procedure, though perhaps somewhat unorthodox was adopted with the intention that when the alter course signal was hauled down, MATABELE should alter to the signalled course and remain steady on it, and not necessarily keep station on EFFINGHAM till EFFINGHAM was correctly on her course whereafter the guide pendant could have been rehoisted. Although this procedure may have cause some doubt to MATABELE it coould have and did have no effect on her subsequent grounding and is therefore not material to the issue. 16. As was intended MATABELE altered course to 097° when EFFINGAM hauled down the alter course signal - the right centre of Sjurshl Island then bearing 097° from EFFINGHAM, the East shore of Stangeroy island abeam to starboard. 17. Very shortly after altering to 097°, MATABELE was observed to alter suddenly to starboard and to reduce speed. EFFINGHAM was at that moment about to alter to 097 but on seeing MATABELE swing to starboard, starboard wheel was ordered with a view to sheering off and leaving MATABELE on EFFINGHAM`s port hand. 18. At 1948 1/2 EFFINGHAM grounded heavily and swung sharply to port. I immediately blew a long blast on the syren to warn ships following. 20. The ship`s position was fixed at the earliest possible moment~- 1950 - as follows : 1 ½ cables south east of Faksen Shoal - ship's head 046° - speed about ten knots. 21. After grounding EFFINGHAM commenced to settle slowly on an even keel, but the engines had stopped and both boiler rooms and engine rooms commenced to fill rapidly ,flooding subsequently spreading to compartments forward and aft of these compartmnets. For a time, until steam was no longer available,EFFINGHAM had steering power and starboard wheel was ordered. Electric power failed shortly after grounding as steam supply ceased. 22. Immediate steps were taken to close all water tight doors and to shore up bulkheadse. The latter was effective enough to support the bulkheads temporarily but it was clear that the bottom was ripped open for much of the ship's length and water was entering in many places at a speed wihich could not be controlled. 23. Nevertheless, the ship remained on an even keel settling slowly for a considerable time, although from reports I received I anticipated that at any moment the bulkheads would give and the ship heel over. Having some 1020 troops on board, as well as the ship's company I was concerned to beach the ship with a view to saving as much life as possible. 24. At about 2015 ECH0 was ordered alongside to transfer the troops and at the same time instructed to tow me towards shelving water northeast of Briksvaer Island. Very little way was made but sufficient to carry EFFINGHAM on some distance before ECH0 had completed embarking the troops and some 250 - 300-of the ship's company, and had cast off her wires. (about 2045). 25. About this time Rear Admiral Commanding 20th Cruiser Squadron directed me to sink the ship in deep water, if possible, but with no stern pover available and with slight headway and slight windage the ship, still on an even keel, gradually drifted broadside on to position north of Skjoldshl Island where she eventually grounded in some five fathoms. 26. Demolition charges which had been organised for such occasions could not be implemented since the detonators were in a submerged compartment. The same applied to depth charges stowed in torpedo flat, but primers removed to a compartment already submerged. It was impossible to open the Kingston`s or main circulator inlet since they were submerged, whilst the bilge suctions could not be opened as the spindles had been bent by the damage. The opening of water tight hatches under pressure would have been hazardous to the life of personnel engaged on that work. 27- I much regret that preoccupations with these matters and the saving of life, I overlooked the possibility of letting go the anchors. The ship was then in some 55 fathoms: that I could have let the sheet anchor go is true (the effectiveness of doing so is doubtful) - the letting go of the bower anchor would, in the absence of steam to turn the spindle, have been a prolonged operation involving the removal of the clutches between decks by driving them out by heavy mauls. 28, Meanwhile MATABELE`s boats as well as ECHO's and some of EFFINGHAM`s transferred small numbers of the ship's company to METABELE. 29. Whilst ECHO was taking the first load of survivors to COVENTRY I got out all available boats and carly floats by hand and cleared away loose timber etc., for use as rafts. During this perilod five steel chests of S.P.s and C.B.s together with signal and W/T books were transferred to ECHO. Key memoranda were burned with some other C.B.s Cypher logs, signal logs and all filed copies of messages were either burned or transferred to ECHO. As far as is known the only C.B.s remaining on board were intelligence reports and various manuals in steel cupboards in No, 3 magazine lobby which were submerged at an early period. Fleet folios were also transrerred to ECHO. In addition V.C./V.F. was completely wrecked and dismantled and the vital parts transferred to ECHO. The H/F D/F set was wrecked and vital parts removed. 30. ECHO subsequently returned and came alongside when EFFINGHAM had grounded and took off the rest of the ship's company as well as certain army equipment. (about 2210). 31. I embarked in ECHO who proceeded to COVENTRY where I reported the situation to Rear Admiral Commanding 20th Cruiser Squadron and transferred further survivors to COVENTRY. Rear Admiral Commanding 20th Cruiser Squadron instructed me to proceed in ECHO to CAIRO to transfer further survivors, and then to return to EFFINGHAM with a working party to clear army equipment into trawlers and puffers which lt CAIRO had meanwhile ordered out from Bodo. I was also ordered to try and tow EFFINGHAM to deep water to sink her if this was possible wilth the craft from Bodo. I informed Rear Admiral Commanding 20th Cruiser Squadron that I thought this impossible and that the ship was firmly aground. 32. On my retum to EFFINGHAM about 0010/18th May there were some dozen puffers and two or three steamers alongside with three British army officerss. All army equipment and the stores other than the ten carriers, with the exception of a small amount of barbed wire sand bags and packs were transferred to the puffers and sent to B odo. Two Bren Carriers were hoisted into a steamer and sent to Bodo. As many gun sight tele6copes and binoculaes as possible, toghther with the great majority of ships rifles werse taken away. When this had been done the sh ip was abandoned. She was firmly aground by the bows and continuing to make water; the stern was however now lightened to aproximately normal draught. Unsuccessful efforts were made by the two large steamers to tow her off. I did not consider it prudent to risk ECHO in attempting to tow her especially as a Heinkel (later engaged by 3 Skuas) was sighted about this time. 33. Having done everything that seemed possible and it was desirable for ECHO not to remain in the vicinity, she sailed for Harstad. (at 0345). 34. I decided not to leave a party on board EFFINGHAM since they would be out of communication with the world, subject to air attack, and the problem of feeding them would be difficult. 35. Subsequently on passage to Haratad I appreciated that although the ship could not be sailed, enemy flying boats or submarines could send parties on board, and the guns had not been rendered unserviceable. 36. I therefore decided to risk air attack and ordered ECHO to return to the vicinity of EFFINGHAM and at 0700 a party was again sent on board and practically all ready use ammunition was thrown over the side and all possible action taken to render n the guns useless either by removing locks or strikers or putting sand in working parts eto. 37. During ECHO's absence a steamer had embarked a furthe r two Bren Carriers for Bodo, but without fully equipped salwage plant and derricks it was considered impracticable to lift out the remainder. The tide had risen and the ship was now much lower in the water and even more firmly aground than berore with only 3-4 feet of freeboard. There was no likelihod of her being towed off, and so I decided to endeavour to assist her disintegration by firing a torpedo aimed at the region of her mainmast to break her back. Although only in some five fathoms of water I felt this action was desirabe and might assist in turning her on her side. Accordingly, one torpedo was fired and she at once commenced to list to starboard and sink further. When last seen the starboard side of her quarter deck was awash. 38. It being undesirable to risk ECHO by remaining in the vicinity without air protection I then ordered ECHO to sail for Harstad. (about 0900). 39. In connection with this lamentable occurence I desire to bring to your notioe the efficient and seamanlike manner in which Commander Spurgeon D.S.O., R.A.N. H.M.S. ECHO handled his ship and enabled all surrivors to be taken off. I also wish to comment most favourably on the excellent behaviour of the troops in circumstances unusual and alarming for them and I would particularly like to brilng to your notice the exemplory conduct of the officers and ship' company in very trying conditions. I hope to bring to your notice in due course the names of a limited number of those particularly worthy of mention.